Anxious excitement bubbles up as I enter the condo. I try not to think about all the places I’ve gone into without permission since Charlie’s been around, I keep telling myself it’s not wrong, that our reasons are always to help people, but I know that it’s still breaking the law and that we’ll have to deal with the consequences if we get caught. I also know that the thrill of it gives me a buzz. Wolfe in Shepherd’s Clothing is the third book in the “Shepherd & Wolfe Mystery” series, with the first two books being Along Comes a Wolfe and Shepherd's Watch. Structurally, Wolfe in Shepherd’s Clothing follows the pattern established by the earlier books by being divided into four parts and beginning with a “prologue” in which readers are introduced to the book’s anonymous killer. Throughout the book, the authors insert occasional chapters told from the serial murderer’s point of view, a device which effectively adds to the book’s tension. The book’s title comes from the fact that Charlie Wolfe literally does wear a shepherd’s clothing (Tony Shepherd’s that is), after Charlie finds himself homeless and the Shepherd family offers to take him in. It’s the spring following the events of Shepherd's Watch, and Tony Shepherd’s parents are celebrating their 25th wedding anniversary with their family and friends, an event to which Detective Gekas has been invited. When Gekas verbalizes her disquiet about her inability to solve two grisly murders that occurred during the fall, murders which saw the bodies dismembered and placed in canvas bags tied with purple ribbons, Tony interprets her sharing this information with him as Gekas’ indirect way of communicating that she would appreciate “quiet” assistance from him and Charlie. Because of the teens’ earlier life-threatening involvement in solving other murders, Tony’s parents have them both on a very tight leash. Interestingly, in a character inversion, it is Tony, not Charlie, who this time takes the lead in breaking the rules as the killings mount, with one victim being someone very close to Tony. Authors Counios and Gane have concocted an excellent piece of crime fiction, one filled with the appropriate number of red herrings and a delightful misdirection as to the serial killer’s identity. What could have been a tired trope, a pair of adolescents’ entering what is supposedly a deserted and abandoned house, becomes a truly tension-filled episode towards the novel’s conclusion. 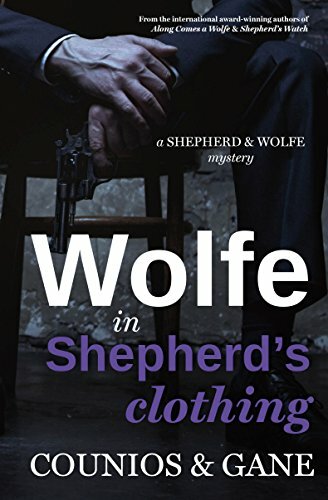 Wolfe in Shepherd’s Clothing works well as a stand-alone read, but those who have read the other books in the “Shepherd & Wolfe Mystery” series will recognize the passing references to happenings that occurred in the earlier novels. With Tony’s graduating from high school and heading off to college to study justice and specializing in police studies, readers might be inclined to think that the authors have brought the series to a tidy close. However, the novel’s final word, help, the contents of a text from Charlie to Tony, happily suggests that readers may have another opportunity to join this pair in exposing and apprehending yet another serial killer.